Independence Brewing Company sits on the edge of census tract 48453002411, one of 21 tracts in Travis County designated by the federal government as "opportunity zones." Census tract 48453002411 has a lot to offer. There’s a brewery on the north edge of the tract. There’s a neighborhood park, and you’re not too far from McKinney Falls State Park. On a good day, you can drive from this part of Southeast Austin to downtown in 20 minutes. But census tract 48453002411 also has its challenges. According to 2016 estimates, the median family income is roughly $37,000. The unemployment rate is nearly double the national number. Given all this, local, state and federal officials believe this tract – like 20 others in Travis County – has room to improve. And they’re hoping a little nudge to private investors will help. Cue: Opportunity Zones. The bipartisan measure added to the Trump administration’s tax reform bill, approved December 2017, creates tax breaks for private investors in low-income census tracts. “This legislation says there’s a way to attract real capital into the distressed communities by having a tax incentive so those who have take a second look, and a different look, at those who do not,” said Sen. Tim Scott (R-South Carolina), who co-sponsored the measure. But while Travis County has 21 Opportunity Zones, Austin officials aren’t quite sure what to make of them. 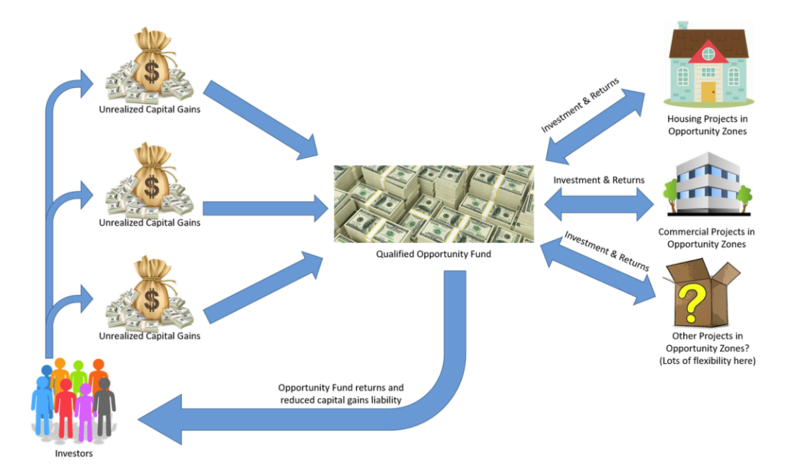 Under the program, investors can put capital gains money – any profit from another investment – into an Opportunity Fund, which would then be spent in one of these designated zones. The longer the money is kept there, the less it’s subject to taxes. Keep it there for a decade, and the capital gains tax on funds accrued is forgiven. “It has the potential to be the nation’s largest economic development program, depending on how things play out,” said Brady Meixell, a researcher at the Urban Institute, a think tank in Washington, D.C. There are few requirements for what can be built, he said, and little oversight. Earlier this year, governors were asked to submit eligible census tracts to the U.S. Department of Treasury for inclusion in the program. The department rubberstamped all 628 census tracts that Gov. Greg Abbott submitted in March. Most of Travis County’s zones sit east of I-35, many of them in Southeast Austin. But Mark Rogers, who builds affordable housing in parts of East Austin with the Guadalupe Neighborhood Development Corp., said investment in Opportunity Zones would likely accelerate or set off gentrification. Rogers said there need to be anti-displacement policies in place to protect current residents in these areas. Last year, Austin Mayor Steve Adler convened an anti-displacement task force, but it has yet to release any policy recommendations. Meanwhile, public entities aren’t quite sure what to make of these zones. (The federal government still needs to finalize some rules for them by the end of this year). The Greater Austin Chamber of Commerce said it didn’t feel comfortable issuing a statement about them because it was "still learning about these zones over here.” Adler said the city doesn't have a policy yet for cultivating any public-private partnerships in these zones. Council Member Delia Garza is hoping the city will craft some policy. Many of the Opportunity Zones are in her district – likely because she nominated them to the governor earlier this year. “I got this email that said, ‘Nobody knows what these are exactly, but they look like they could be good opportunities,’” she recalled. Garza said she wants to bring a grocery store to Del Valle. While public officials consider how they might harness this new potential investment, at least one Austin-area real estate investment firm – Shell Real Estate Services – is already identifying Opportunity Zones throughout Texas for its clients to invest in.